Saying that Dragon Quest is popular in Japan is like saying that Americans are rather partial to hamburgers or that Brits like to indulge in a hot cup of tea every now and then. Since going on sale July 14th, Dragon Quest IX - the latest entry in the long-running franchise - has shifted an incredible 3.39 million units. The game is developed by Level-5 and is a DS-exclusive. A western release date is still to be announced. I'm one of those 3.5 million. Unfortunately, I bit off this Game Boy special and I haven't even really gotten a chance to play Dragon Quest IX much yet. Isn't the battle system always in the first person perspective with the Dragon's quest series? This looks alot different. I might have give it a try. No random battles, or so I heard! Hooray!!! Western release date, please, and before Christmas if you don't mind. Chop-chop. Looks to be great. Can't wait! I wish it was as popular here in the states. The rumor is a December release, but I'll believe it when I see it. SE's expecting 5 million, so its not 'there' yet. Am playing through Dragon Quest VIII at the moment. Don't know how I missed it when it was originally released. Fantastic game. Can't wait for IX. Dragon Quest IX also looks rather delicious. Here's hoping that Square Enix gets this ready for a western release too! I can't wait to buy this when it comes out in North America! Koto, you summarized it pretty well. I wish we could be more like that. This is my most wanted game of the year! I cannot wait for this game to come out! This game will be better than even the tastiest hamburger! as most people know, Dragon Quest 7 got delayed for YEARS. Be prepared for a few delays....I dunno what it is about Dragon Quest games and the time required for translation/western release, but be ready to wait! I am shock! I cannot believe that it did that well. 3.5 million!? In a goddamned MONTH!? If only Retro Game Challenge sold that well. 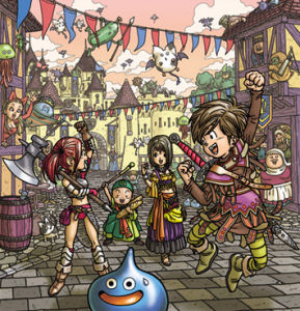 I can't wait, I'm currently playing through DQV, which will likely end up as one of my favourite games, by the end of it. I just finished a nice solo, of another one of my favourites DWIII, tis great stuff. @Blue Protoman.... yeah really. Americans cant buy a great game if somebody tried to make them unless its a well known IP or Sports games.